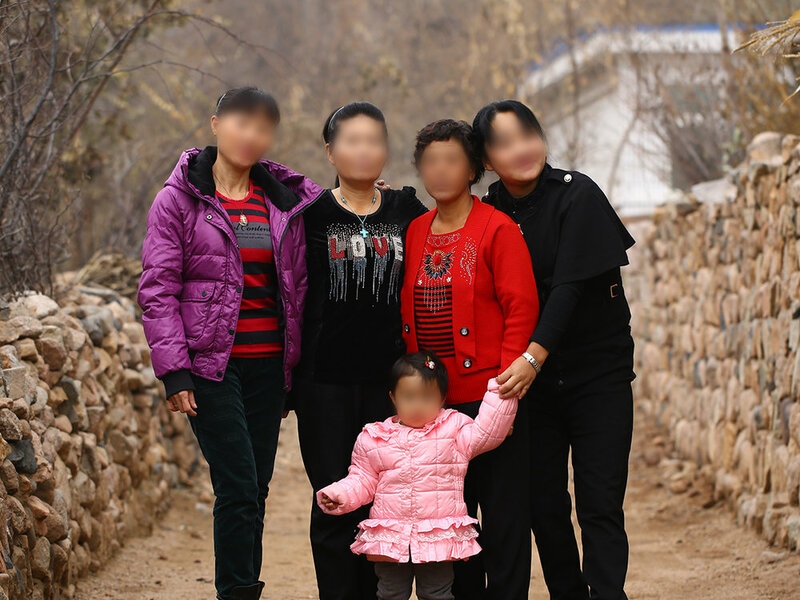 Four North Korean refugee women with one of their children born from a forced marriage. This year marks Crossing Borders’ 15th birthday. I’ve been a part of the organization since the very beginning and have watched it grow from its infancy to where it is today. It has been an incredible ride filled with joy and hardship. My biggest privilege has been the interactions and relationships I have formed with the North Korean refugees in our care. I have lived through days in my personal life that I would rather forget and my family has gone through a bit of suffering. Lost businesses, broken limbs, cancer and death are all a part of the pain one endures even in a modernized country. And these things are traumatic. But as I’ve gotten to know North Korean refugees, one thing is crystal clear: the pain and suffering I endure as someone who lives in the USA is undeniably less than the hurt in the life of a North Korean. North Korean mothers have watched their children wither away in the famine. People have witnessed cannibalism. A pregnant woman’s belly was beaten mercilessly for carrying a half-Chinese baby. People have been bought, sold and traded like household items in the silent system of human trafficking. These are all things the people in our care and our workers on the field have shared again and again with me. Even now, this brokenness in North Korea continues. This matters in my life because, no matter what I go through, I know that I have so much to be thankful for. In my darkest hour, I can take stock and comfort in great degree of safety, liberty, and justice I have been granted - just for being born in a different part of the world. I do not deserve this kind of peace or comfort any more than the North Korean people I have met, but I realize I have been given so much. I once interviewed a North Korean woman who lost her family in the famine. She thought that death was inevitable because she too was starving. She went behind her house and laid down near a creek to die. She laid there for hours. But even as she lay there, immobile, powerless, and hungry, for some unexplained reason, she did not die. After several hours on the ground, she stood up and walked for the border into China. Now, over two decades later - after having trekked into a foreign country hostile toward North Korean refugees, after having been sold into human trafficking, after having survived year after year, she is still alive to share her story. The North Korean refugees that I have met in China have similar tales of miraculous survival despite all odds. For some reason, they did not die. Some might call it luck, others providence. Whatever it is, those who have survived the worst famine in modern history are more than resilient. I have come to admire the will and grit of these people. They inspire me to push myself everyday. I have seen North Korean refugees separated from their children too many times. I have met North Korean women in South Korea who have left children behind in China. I have also met North Korean mothers in China who have left children behind in North Korea. In 2009 I met a family who left their youngest daughter behind in North Korea. She had been left in the care of a relative until the family could find the funds and connections to get her out. I sat with this couple as they ate at a restaurant in Northeast China but it was clear that they didn’t have much of an appetite. They could only talk about their daughter. The mother nibbled at her food, tears flowing from her eyes the whole meal. Since the family fled North Korea, their daughter could have been sent to a prison camp. She could have been left out in the street by their relatives. I cannot, to this day, imagine the kind of fear that must have been present in this North Korean mother’s heart as she escaped North Korea. Fortunately, Crossing Borders was able to help this family. It took months and months of planning but finally their daughter was able to escape and be reunited with her mother and father. There is something universal about the desperation a mother feels when separated from her child. This desire is stronger than any other human instinct I have seen, perhaps just as strong as our instinct for survival. All North Korean refugees will be affected by the North Korean government for the rest of their lives, even if they live on the other side of the globe. A strange thing happened in countries that espoused Communism, rather than making its people more collectivist, Communism has given its people a more every-man-for-himself attitude. The North Korean system is based on the idea that, together, the North Korean people can become fully self-reliant. The nation has taken draconian measures to ensure that people comply. People will publicly tell lies to stay out of trouble. They know that their government has also lied to them. What this has created is a whole society that is based on lies. This behavior is tacitly taught to every citizen. Don’t show your hand or someone will come take you away at night. Don’t share your feelings, even to your own children or you may be reported, imprisoned and executed. North Korean refugees cannot shake this kind of fear even when they leave their country. And sadly, many maintain this habit that was indoctrinated in them even after they leave. After all, over 200,000 of them still reside in China - where North Korean refugees must continue to lie about their identity, nationality and beliefs just to survive. Despite the overwhelming odds against joy or peace in their lives, a state of hopelessness is not present in the lives of all North Korean refugees. Some have found a way to break free from the grip their government has had on their lives and, through faith in God or other means, many have risen above their circumstances. I wrote a story about this in the past. I once played a modified version of the staring contest with a North Korean refugee. Underneath her stone-cold stare was an iron will that would not bend to me or to anyone. Needless to say, I did not win the contest. Despite all of the hardships the North Korean people have endured, there are those who have found a way not to let their government take what is most pure and special in all human beings. In many ways, the North Korean government has found a way to make their people comply. But within a few of the North Korean refugees I have had the privilege of meeting is an indomitable spirit that will bend but never break. There are some who have suffered with the spirit and strength to cling to things that we could not see, who are able to withstand seemingly insurmountable odds by holding on to deep-seated, immovable hopes in peace and joy to come. I truly believe that God can use this more than any actions by governments around the world to free the North Korean people. Newer PostNorth Korea's "Father of Defectors"